Highlead GC0518-PS needle feed industrial sewing machine. Fitted with close coupled roller puller feed device. Highlead GC1188 sewing machine with racing close coupled roller puller feed device. Back mounted gearbox driven small roller type. Serviced and tested with used sewing machine warranty. 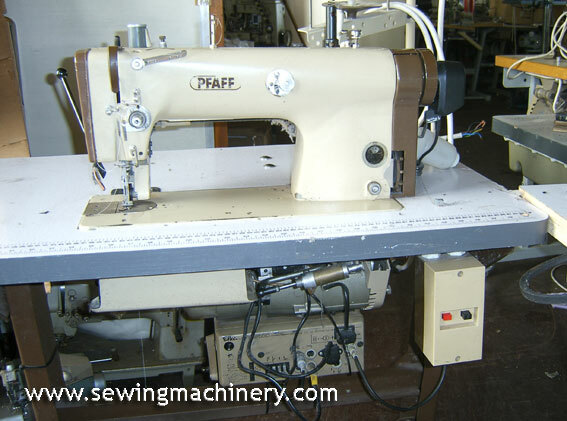 Pfaff 483-748 900/00 High speed lockstitch machine with Pfaff 748 Puller Feed unit, auto thread trimmer with Efka needle position motor. Singer 591UX313 lockstitch machine with built in puller feed, automatic thread trimmer, stitch program, electronic needle position motor, auto foot & puller lifter etc. Very high spec puller feed machine. Suitable for large folder binding etc. Singer 591D303A lockstitch machine with built in puller feed. On unit stand with standard clutch motor 2 available. Brother B872-405 Twin needle sewing machine, needle feed with large hooks, auto thread trimmer, automatic reverse and F40 stitch program. + auto foot lifter device.